Artefacts, in Victoria Layout, is a treasure trove of all things antique and vintage. 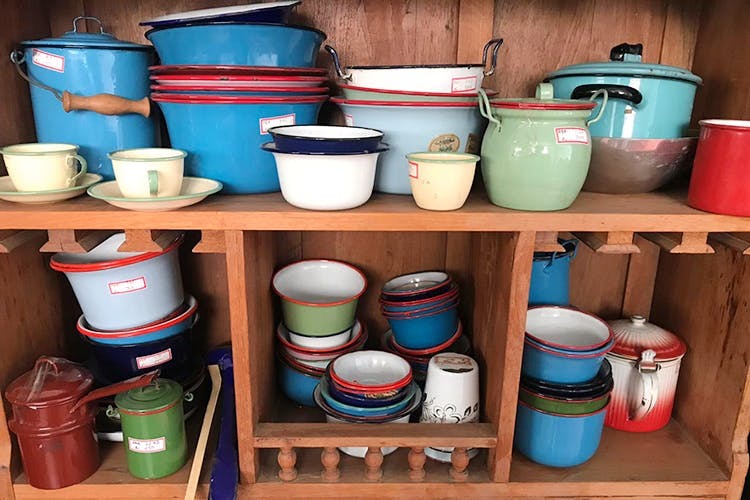 Enamel crockery of all sorts and sizes, lacquer boxes, and a whole lot of rustic decor pieces like door knockers and brassware are what's on offer. There's no dearth of antique stores in Bangalore, but there is still room for another, in the form of this 25-year old antique dealer in Victoria Layout. Tucked away in the bylanes, Artefacts is home to a whole lot of antiquities, vintage decor, and architectural pieces. Stepping into the studio is like stepping into a museum. It's spread across three floors, so one of those quick visits isn't going to help you find what you are looking for. Moreover, when you browse through the treasure, you will see that they are quite affordable too, with the owner telling us the price range is between INR 500 and INR 50L. Now, you got to get your hands dirty while you browse through the numerous vintage and antique junk that's propped up against the walls, on shelves, and pretty much anywhere there's space. You will find old vinyl records piled on top of Victorian chairs made from rosewood, and brass idols, door knockers, and statutes stores away inside beautifully carved cupboards and cabinets. Enamel crockery consisting of pots, pans, plates, bowls, and ladles, and Dutch plates are what we are digging. Then there's the whole collection of lacquer plates and boxes that make for some really cool decor inspo. If you have the money to splurge, then the movable furniture like sofa sets, easy chairs, Portuguese cupboards, and solid wood chairs are something that will interest you. It's dusty and if you have dust allergy, then we suggest you go with a face mask or ask the store manager to help you out. The owner will be more than happy take you on a tour around the place and explain in depth as to how the studio's heavy South Indian collection came about and where each and every piece are sourced from.